In order to keep up with their demanding tour schedule while still remaining prolific, Chicago’s own Twin Peaks decided to record and release a series of singles in the latter half of 2017, two per month, culminating into a full records worth of new material. This new project took inspiration from a similar project by Memphis punk revivalist Jay Reatard from ten years prior in his Matador Singles ’07. Ultimately, this project has allowed the band to experiment outside of their regular garage-rock/country-folk blend, and provides fan service to their dedicated followers over the years. Listening to this project front to back, the record feels incredibly fragmented as the band hops through genres they haven’t previously explored. Experiments into psychedelic rock, bedroom pop, acoustic folk, and Grateful Dead-esque jam sections make appearances all throughout, as do some inconsistent mixing techniques. Though one consistent feature did stand out to me and that was the keyboard work. In previous record(s), keyboardist Colin Croom has taken a backseat to the more guitar driven rock tunes. However, on this project we can hear a whole array of new synth textures that are often prominent on these songs. It provides a nice change of pace from old material and could really open up many new avenues for the band to explore in the future. 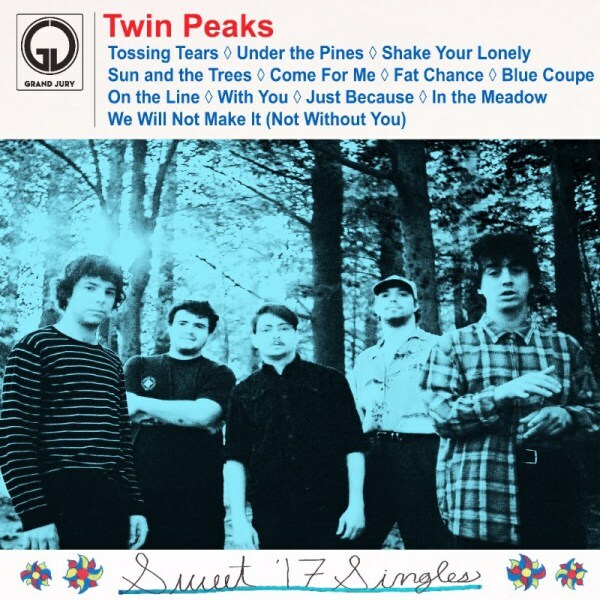 Given their lineup situation, with four contributing singer/songwriters all of whom have proven can hold their own, it’s no surprise that most of Twin Peaks’ previous releases are stacked with good songs, and this project doesn’t fall too far from that reputation they’ve built. Some of the best songs in the band’s discography show up on this compilation. Cadien James hones his inner Lonerism on “Tossing Tears” and singer Clay Frankel unveils some Nashville Skyline type inspirations on his beautiful country-crooner “Shake Your Lonely.” But the standout track on this compilation is Jack Dolan’s “Blue Coupe” a powerful song about the loss of a close friend. A very difficult and emotional event that Dolan channeled flawlessly in his songwriting. My only gripe with the recording is that his authentic and incredibly poignant lyrics are buried deep in the mix, they really do deserve a read-along. I’m sure that the songs I’ve mentioned will remain staples in their live set for years to come, but some of these songs on the other hand, feel a bit like B-sides or demos from earlier albums. On a project that was dedicated to exploring their creativity to its extents, hearing songs like “Under the Pines” and “Sun and the Trees”, which felt like unreleased/cut songs from Down in Heaven and Sunken respectively, left me a bit disappointed. Overall, this is a project meant for the fans of Twin Peaks and those who’ve supported them for the past few years they have been around. Outside of that, it doesn’t offer much in terms of a complete and consistent project, but does leave us with a few great singles. But if you really need your fix of new Twin Peaks, or want to explore some of the bands’ deep cuts that may have not been shared without this compilation, you should give this one a listen if you haven’t already.